We were invited to an outdoor movie party for Olivia's soccer team. Meant to be an all fun and low key event guests were asked to bring finger foods to share. I always struggle with the what to bring. I did a little thinking and with the help of the internet came up with something simple but fun. I decided to give pizza pinwheels a try. What I did was roll out some pizza dough. I made my own dough since it was easier and we eat pizza so often I can make dough in my sleep. I decided to keep the toppings simple: cheese and pepperoni. I set the toppings on the pizza as I would normally do and instead of tossing the pie into the oven I rolled it up. Wrapped it in foil and let it chill in the fridge for an hour. 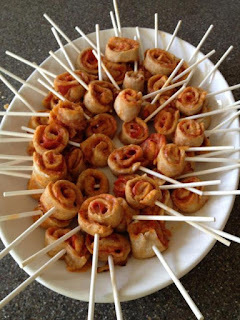 Later I sliced the pizza roll into small portions placed the pinwheel slices on a parchment paper lined cookie sheet and baked them about 10 minutes at 400 degrees Fahrenheit. What I learned with the first batch is: that makes a BIG pinwheel. I decided to correct my size problem by cutting that big roll down in size. Since I had sliced all the pinwheels for that roll I unrolled each wheel and cut them in half. That seemed to work enough to salvage that pizza roll. They still ended up large but not plate large.When I made my subsequent rolls I just used less dough making smaller 6" pies. This kept the pinwheels at a close to bite sized portion. When the pinwheels were cool enough to handle I stuck them on lollipop sticks. It was a big hit. The kids AND parents loved them. Next time I think I'll keep it even easier and just make a rectangle sized pizza. After I bake it I'll let it cool slightly then cut it into thin strips. That way I can just roll up the pizza strips to the size I want and put them on lollipop sticks. I think that method will give more pinwheels and allow me to keep them bite sized.